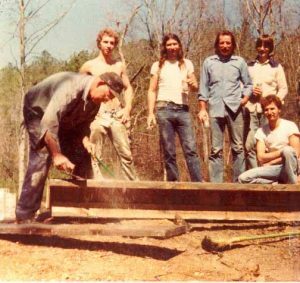 We started our underground home in 1974. We did all the research we could and talked to a couple of architects and one structural engineeer. She was the most helpful, taking us seriously. We were very young and naive about how much work it would take but our families were supportive and with lots of help from friends and family we finished the basic structure in about 8 years. We moved into the home that was far from finished in 1983. We took several more years to “finish” the home and do some basic landscaping. We’ve actually been working on the home and landscape ever since. The first pictures are some of the early stages and they are poor quality. This was long before digital cameras and phones. Some of the guys who helped build our home. I’m the curly headed guy without a shirt.